Capital One Platinum is described by Capital One as a credit card for people with average credit. That means you don't have excellent credit, but you don't have bad credit either. For Capital One's credit approval purposes, average credit means you've defaulted on a credit card or loan within the last five years or you've had your own credit for less than three years. Capital One used to have two Platinum credit cards—a Standard Platinum and a Classic Platinum—both for people with average credit. The Platinum Card seems to have merged the two credit cards into one which eliminates the hassle of deciding between the two. You won't earn any rewards with the Capital One Platinum Card, but that doesn't mean the card isn't beneficial. First, because you can get approved with average credit, you can use the card to start rebuilding your credit so you can qualify for something better in the future. If you're approved, your minimum credit limit will be $300. While it's on the low side, it's not terrible to start out with. Capital One says it will raise your credit limit if you make your first five monthly payments on time. If you think you'll have trouble making your payments on time, just set up an automatic bill payment with your bank. 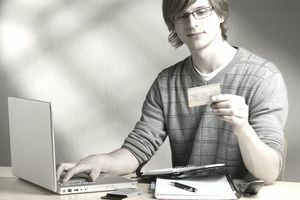 The bigger credit limit will not only give you more purchasing power but will help you qualify for bigger limits with other credit card issuers in the future. You can transfer balances to the card, but only after your account has been opened for 10 days. However, you won't be able to transfer a balance from another Capital One account. That includes retail cards issued by Capital One. You can keep track of your credit score with Capital One's CreditWise tool—a perk that's actually available to anyone, even if you decide not to go with the Capital One Platinum Card. The Capital One Platinum Card has no annual fee, which is a plus. Many credit cards for people with less than perfect credit charge an annual fee. The interest rate is a relatively high 24.99 percent for purchases, balance transfers, cash advances. You can avoid paying high finance charges by paying your balance in full each month. Avoid cash advances because they do not have a grace period and begin accruing interest right away. The cash advance fee is $10 or 3 percent of the cash advance, whichever is greater. You'll be charged up to $35 for any late payments on the credit card. You should make every effort to make all your payments on time, not only so you can avoid a late fee, but so you keep your account in good standing, earn the credit limit increase, and improve your credit score.